Spyderco says this is a modified bowie shaped blade, but this is a trailing point shaped blade, which gives it more of a belly than you would expect in a knife this wide. The edge geometry is a little thick for EDC, but works well for a camp knife or it's intended role as a self defense implement. It's a full flat-ground blade using the now popular CPM S30V. I've used and abused this knife and have never had problems with chipping or losing it's edge too quickly, e.g. ad hok military use to cutting wood while camping to using it as a steak knife. The jimping on the spine is aggressive and works well for gloved hands and is comfortable for heavy use with naked hands, I find it to be the perfect amount needed. There is a choil, for chocking up, but it has no jimping, I never found it to be a problem as the jimping on the spine is more than sufficient. The handle material is a simple black textured G-10, which puts up with abuse quite well. The ergonomics of the handle is comfortable and I've never had hot spots from extended use. I have huge hands and this handle fits me almost perfectly, it could be a little longer IMO (it's a little tight, but not uncomfortable). 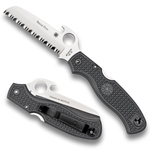 There are full-length steel liners for added strength and weight, Spyderco could have skeletonized them and lost nothing (their web site says they are skeletonized - I actually like the added weight and have never bothered to change it or complain about it with this particular knife). There's also a lanyard hole in the heel of the would-be pommel. The pocket clip does an exceptional job considering the size and weight of the knife. It's not as high up on the knife as many would prefer, about an inch+ of the handle is visible while utilizing the clip. The intent behind it was quicker ability to grab the knife when in a self defense situation. I always found that it was a good setup with the size and shape of the knife. It is drilled for four-way positioning, but I've left it in the manufactured placed right-side tip down position. The pocket clip is lightly powder-coated (more durable than paint, but will still wear on the edges over time). 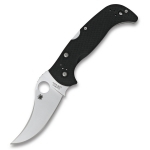 This knife is designed for heavy-duty use and has a lock-back equal to the job. I've used the knife to clear away over a foot of built up ice and to chop down 4" trees and have never had a failure. The blade has a 14mm hole for deployment. Spyderco knives are just begging to be opened in the spydie drop method (pinch the hole and flick) and it opens flawlessly every time. You can still open the knife in more traditional one handed methods. Even when the knife is absolutely filthy it opens smoothly (dirt, sand, blood, guts, and/or oil I've never had a problem). I do take my knifes apart when they need cleaning when the opportunity allows. There's very little to no play in the blade and all the parts line up smoothly, even after taking the knife apart for cleaning. Effort was made to round all the edges on the handles. There are great markings on the blade (Spyderco CPM S30V on one side and Golden Colorado U.S.A. Earth and James A. Keating's signature on the other side). All of the screw holes are countersunk with rounded star headed screws just barely poking out. The Spyderco symbol is etched onto the pocket clip.